Our mobile home is placed in a context that devotes ample space for children and relaxation: there is a small playground, a market and bowls, a large tent with chairs and armchairs TV to enjoy the summer air of Sicily more genuine. The sea beach of San Leone is 2 steps, featuring sandy beaches and crystal clear waters. The famous Valley of the Temples is 3 km from the village. 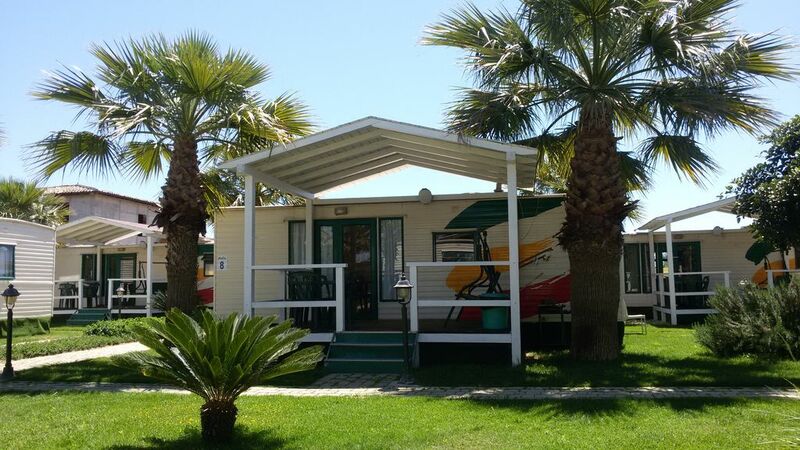 The mobile home is composed of a bedroom, a room with single bed and a bunk bed, bathroom with shower, kitchen with oven, stove, fridge, cutlery, pots and pans and all the dishes necessary for cooking and TV. The environment is naturally air-conditioned. Complete Casa mobile veranda with a table, chairs, un'altalena and a comfortable barbecue. Buona sistemazione, pulita, abbastanza vicina alla sublime valle dei templi, alla suggestiva svala dei turchi e alla bella spiaggia punta bianca. "Très propre, proche de grandes plages 3/5mn en voiture.Point de chute idéal pour rayonner. Le personnel( Editha,Salémé, Francesco) très serviable.La clim est silencieuse.Nous avions le Bungalow 12 situé au fond, très calme.Parking fermé." The good fish and Sicilian cuisine you can eat at a restaurant located 50 metres from our structure.